We believe that eating dense animal protein sources makes you healthier, and that there are some serious drawbacks to conventional vegetarian protein sources. But eating meat isn’t always an easy assignment – there are a number of reasons you may have trouble eating meat at every meal. Some have ethical concerns about the way our animals are raised, fed, treated and slaughtered; others have taste or texture issues with certain foods that make meat in any form hard to swallow; and many are former vegetarians who want to reintroduce meat into their diets, but don’t know where to start. But it’s not easy to be meat-challenged in the CrossFit/Paleo world, where bacon is revered and meat-eating is practically its own sport. Sometimes, it’s hard for folks to ‘fess up to the fact that they have a hard time eating the stuff. (And if you’re a CrossFitting vegetarian, you’ve got even more pressure to get your carnivore on.) Regardless of your particular difficulty with eating meat, there are some steps you can take to make the reintroduction (or continued consumption) of meat easier and more enjoyable. So for those of you who are meat challenged, or vegetarians looking to dabble on the meat-side, use these tips and tricks to make your protein requirements that much easier to stomach. This topic is one with which we both have personal experience. Dallas was raised vegetarian, and didn’t start eating meat until he was 20 years old. Melissa was a semi-vegetarian for a long time, eating only fish and eggs from her late teens until her mid-twenties. Dallas didn’t have a hard time introducing meat into his diet, but Melissa’s transition was slower. She has texture issues with food, and the idea of eating flesh was hard to stomach (pun intended). As her training changed – particularly when she started picking up heavy stuff – her tastes began to change. She began craving red meat, and had to figure out a way to increase the amount of protein in her diet in a way that didn’t make her dread every meal and snack. We decided to compile our recommendations here as a free resource for those struggling with the same issues. For those of you who are willing to eat meat, but have ethical concerns around choosing animal protein sources, we understand. It’s the whole reason we began our Conscientious Omnivore series, dedicated to helping you make animal protein choices that you can feel good about. Review our Conscientious Omnivore series of posts. Currently, we’ve got write-ups on seafood and eggs (which also overlaps with making healthy chicken and turkey choices) – and we’re working on adding posts on beef, pork and other relevant issues. Utilize other resources to help you make choices you can feel good about. You can use Eat Wild, US Wellness Meats, the detailed Shopping Guide in your Whole30 Success Guide or our Foundations of Nutrition workshop packet to help you make meat, fish and egg choices that are good for your health, the animals and the environment. For those of you with taste or texture issues, or who have a hard time with the general idea of eating flesh, here are some ideas to help you make the meat you’re eating more palatable. Choose meats or cuts of meat that aren’t as “fleshy” or fatty in texture or format. Lighter, flakier fish are often a good, neutral texture choice. Ground beef may be easier to stomach than a steak. 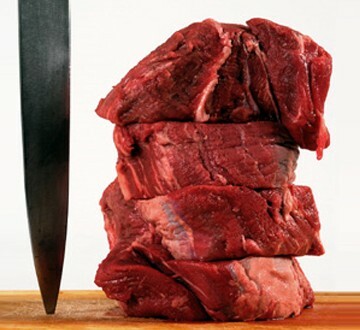 Lean cuts of meat may also smell (and taste) better to the meat-shy. When preparing chicken breasts, pound them with a meat tenderizer so they’re thinner and more tender. Cut your meat into small pieces or chunks before cooking. Sometimes, staring down at a big hunk of meat is enough to turn your appetite off. Chicken and beef, especially, are easier to eat if they’re already in small pieces when they hit your plate. Plus, this prevents you from hacking into a big hunk of fat, gristle or other icky meat-related stuff while eating. Avoid meat on the bone, like ribs or chicken wings. Pulling flesh off the bone only serves to reminds you of exactly what you’re eating. Don’t over-cook your meat. Chicken, fish or steak grilled, broiled or fried within an inch of it’s life will only taste rubbery and tough – and make it harder to get down. (It’s also not very healthy.) If you’re nervous about under-cooked meat, try using a meat thermometer and following recommended temperature guidelines. Remember, meat continues to cook after you pull it out of the pan, so don’t be paranoid about a slight pink hue in your chicken – by the time you get it to your plate, it will be perfect. Cook your meat for a long, long time. We’re not talking about over-cooking, only slow cooking. Consider kitchen appliances like crock pots or slow cookers. These allow you to cook your meat at a very low temperature for a very long time (without exposing it to air). This will make your meat tender and juicy, without any of the risks posed by grilling or cooking to well-done on high heat. “Hide” your meat in other parts of your meal. Meat mixed up into a soup, stew, curry, salad or mixture makes it easier to sneak it in without you noticing. (This technique works well with a crock pot or slow-cooker, too.) Cut it up into very small pieces, mix it into your meal and you may not even notice the taste or texture. Some vegetarians, like Dallas, just dive right into eating meat with no mental or physical trouble. However, if you have some concerns about reintroducing meat back into your diet (or the idea still makes you a little squeamish), all of the above recommendations still apply. In addition, you might want to consider a few additional tips to make your re-entry into animal protein sources that much easier. Start with light, lean, easily digestible protein sources. Typically, eggs and fish or shellfish are easiest to start, maybe because they’re the least “meat-like”. Save heavier stuff like ribs or steak until you’ve become a bit more used to meat’s taste and texture. Start off with small portions. A 16 oz. ribeye may not settle well in your stomach, so don’t overdo it too early. Start with smaller portions, and work your way up to a normal serving of protein with each meal. Consider taking a digestive enzyme. That idea that vegetarians permanently lose the ability to digest meat is bunk, but that’s not to say the first few days of meat eating won’t create some digestive distress. The levels of enzymes that digest protein and fat decrease when you stop eating meat – but they quickly rise again once you ‘get back on the wagon’. However, when your gut is damaged or compromised (like it often is with a diet containing grains, legumes and dairy), a digestive enzyme can help until the gut’s own enzymes come back. Robb Wolf (and we) recommend Now Food Super Enzymes. (Robb talks about this in his PSS Podcast #28, at 20:00.) Always take with food – start with two capsules at each meal, and see if you notice any heat in your stomach after ingesting. If not, after a day or two, work up to three capsules with each meal, see if you notice heat. If not, try four with each meal. As soon as you start to feel some heat in your stomach, back off by one pill per meal and stay at that level for 2-4 weeks. At that point, you may be able to dial back down towards one (or zero) pills with meals. Meat Challenged? You’re not alone. Some people don’t like kale, others don’t like coconut (poor souls)… but just as many of us have a hard time getting our protein on. Don’t let the idea of eating meat distress you – and don’t let the fanatic bacon-pushers get you down. Figure out what works for you, and if that doesn’t include red meat, raw fish or bone marrow just yet, that’s okay. We bet that, using our tips and tricks, you may find yourself actually enjoying your protein more in the coming weeks – and feeling and performing all the better for it. Got your own meat-eating success story or recommendation? Share it in comments. THANK YOU FOR THIS! As a vegetarian for several years, I am having a hard time reintroducing meat. While my stomach is not terribly upset by the delicious chicken and beef, the psychological aspect kept hounding me. It is hard to stick rigidly to an entire lifestyle, then change suddenly. I kept hoping all the principles I held close (like ethical animal treatment and hormone free consumption) would easily transfer to my omnivorous diet. It is extremely helpful to know that others have experienced the same issues and thanks for the detailed advice. Regarding the “Super Enzymes”: I’ve slowly worked my way up to 6 capsules per meal, and never felt the “heat.” Should I keep going, slowly adding more over the next several weeks? What is the recommended upper limit to stop at, if you never feel the heat? I too was vegan and then veg for a total of maybe 15 yrs. I was being pushed so long to change. WHen I transitioned it was first eggs, then fish, then chicken and last was beef. Now I cant get me enough. There is apparently a big following in the MMA community consisting of those switching over to solely plant-based protein. They claim their energy levels shoot way up and recovery and workout intensity are positively affected as well. Wondering what you guys would say about a diet based on only plant-derived proteins, and what meat brings that plants cannot. An MMA fighter on a plant-based protein – really? Despite their perceived energy levels and recovery rates, physiologically a diet lacking in animal protein sources will, in our experience, seriously detract from recovery, performance and health in the long run. Animal products offer a complete amino acid profile, a dense source of protein, and don’t contain any of the inflammatory lectins or anti-nutrients found in traditional vegetarian protein sources like soy, grains or beans. In addition, many of those plant-based protein sources are far more carbohydrate than protein, leading to an excess of carbohydrate in the diet (and all of the negative downstream effects that come along with a diet chronically high in carbohydrate). Great post! Any tips for those that are NOT willing to eat meat at all? Certain seafoods were OK for awhile, but now even that is on the way out the door. With quality protein sources pretty much unavailable at this point, how can we get what we need without having to resort to whey supplements? Eating eggs every day will get pretty old. Thank you for the quick reply, I have a lot of respect for your and Dallas’s opinions and love your willingness to interact with the people who follow your work. As an FYI, here is a story I found on some of the fighters employing that diet. I wonder about individual variability in terms of carbohydrate sensitivity and digestive enzymes. I’m sure you would agree that there is no one-size-fits-all when it comes to someone’s food. We can sit back and say that the lectins and anti-nutrient properties of most plant-based proteins should make them inferior to their animal-based counterparts, but at what point do you say that this person might just run better on this kind of food? Especially those guys in the story who had been big meat eaters for a while before switching over, not just the ones who know no other way. You no doubt have much more experience than I do with managing clients as they undergo nutritional changes. Do you support the idea of re-introducing gluten-free grains/legumes/potatoes back into someone’s diet after they have gone through your Whole30? If the person shows no adverse effects with a small re-introduction of one of these, what about allowing them to integrate that food back into their regular meals? As Melissa said–they are setting themselves up for long-term problems, regardless of the short-term perceived gain in energy. Keep up the good work, Whole9! Thanks for this! I sent it to a FitWit member tonight who asked about paleo & vegetarianism. Get that question a lot! Counterintuitively to a lot of the advice you give here for vegetarians, I have found it a lot more helpful to be ULTRAconscious about the fact that I’m eating meat, rather than trying to trick myself into forgetting that I’m eating it. I take a moment before I eat a piece of chicken to really think about the fact that that animal was once alive, and now it is something that helps me to nourish my body, naturally and the way that my body needs. It helps that I have only been eating ethically sourced meat, because I can think about how the chicken was also eating the things that its body needed to live a healthy life too, and that I’m supporting humane treatment of animals in a way that I couldn’t ever do as a vegetarian, by directing my personal financial support toward farms that raise animals healthily. Thanks for the tips, Hartwigs. As a recovering vegetarian, I couldn’t agree with you more. On a related note, I have noticed a handful of friends and family have developed much more mucous as they start to eat more animal protein (some were vegetarians, others were not). Have you heard of this? Is this a common ailment? I’m with Kayte on this one. When I eat meat, I think a lot about the animal. I think about the ways the animal was strong, graceful, fast, beautiful, funny, and intelligent and I am grateful for taking those qualities into myself. One of my arguments against eating meat was that I was not weak without it. My hair was not falling out. I was not sick all the time. I could do 8 pull-ups. I was, however, a little crazy. Now, my moods and energy levels are MUCH more stable, and I am a more reasonable and compassionate person in all my relationships. As far as digestion, I was expecting to have a hard time with red meat, and in fact beef feels heavy and slow. But elk and bison feel great to me- lots of energy and no problem digesting them. The world is a complicated, beautiful, heart-breaking place. Everything alive is alive at the expense of a multitude of other beings. For a long time, I tried to avoid that reality. Now, I’m grateful for all my meals and hope that- even if it’s just forsome bugs and bacteria- I’ll make a good meal some day, too. I love this look in the comments here at the latest trend in vegetarianism with MMA fighters. One of my co workders does BJJ and has recently decided to go vegan because of this recent popularity in the MMA world and because of reading some books on sustainable meat production. Apparently, reading Eating Animals and The Omnivore’s Dilemma made him want to forgo eating meat instead of purchasing more expensive and healthier meats. The protein source of choice for him is hemp seed powder, which he even admits has very small amounts of protein in it. I just sit quietly in the corner because there will be a time when he realizes that he’s being less healthy. @Morgan: I’ve heard Robb say that if you’re up to 5 pills with each meal, that’s as much as you’ll ever need to do. I can’t think of a reason to keep increasing at that point. @Rich: Recommendations for those who don’t eat any animal products are complicated – too complicated to outline in a comment, or even a blog post. We’ve been thinking about coming up with a Whole9 Life for Vegetarians booklet, outlining best case scenario for all kinds of circumstances – vegans, lacto-ovo vegetarians, pescetarians, etc. We just need to find some time to actually work on it! @Adam: The Whole30 program is just that – a 30 day program. It’s not meant for folks to follow 365 days, and of course after the program is over, everyone has to figure out if (and how) to reincorporate some of those not-so-awesome foods back into their diet in a way that feels healthy and balanced to them. Note, just because you don’t notice any immediate effects from eating grains or dairy doesn’t mean they are making you healthier! It’s not like an allergic response, which you notice immediately. These foods make you less healthy from the inside-out, in a process that is often slow and sneaky. So be careful about using how you feel while eating certain foods as a judge of how healthy they are. Just a thought. @Kayte and Daniela: Interesting – thank you for sharing your points of view here. We follow the same thought process here at home, going so far as to visit the farm where our beef comes from, and asking to visit the chicken farm on slaughter day. It’s not always easy to look at these things in the eye, but when you’re making the best choices for your health, the animal’s health and well being and the environment, it makes it that much easier. @Jennifer: Um, nope. Never heard of anything like that… there are a lot of nutritional myths floating around out there about mucus production and various foods, but I’ve not come across anything substantive to support animal protein sources upregulating mucus production. @Kass: Um, yep. Hemp protein… sigh. @Amanda: Thank you so much for the kind and thoughtful comment. There are a lot of folks in your shoes, and to ignore such a large population because we don’t agree with the decisions they’ve made for themselves would be wrong. We’re going to do as much as we can to help our vegetarian readers (regardless of their “level” of meat-eating) be as healthy as they can! With so many people jumping on the “nya nya nya” bandwagon of ridiculing each other for either eating meat or not eating meat, this talks to all of us with RESPECT. I LOVE THIS POST and want to hang it on my wall. Thank you so much!!! Great article. I was vegetarian for about a year prior to beginning the Whole 30. (Day 17 today) I am still struggling with adding meat. I had read that article about MMA prior to the post and have followed several vegan/vegetarian atheletes. Interesting how they maintain strength and recovery on a plant based diet. I think it is possible, but I know I really struggled to get enough protein while eating vegetarian. Spirulina? It tastes disgusting but it seems to be good protein source if you’re vegan. I tend to have more issues concerning the heaps of studies proving animal protein’s role in cancer grown and promotion, as well as a number of other health issues. I realize the need for more protein as a crossfitter, and I have brought a little back into our diets (we are semi-veg) in the form of grass fed bison, but I couldn’t fathom having meat at every meal. I can’t help but feel like I’m just asking for cancer. My husband’s family has a lot of history with cancer and I don’t like the idea that I could be contributing to his already high chances of developing it.